Thorough Salvage: Salvaging will take more time, but also yields munitions resource. 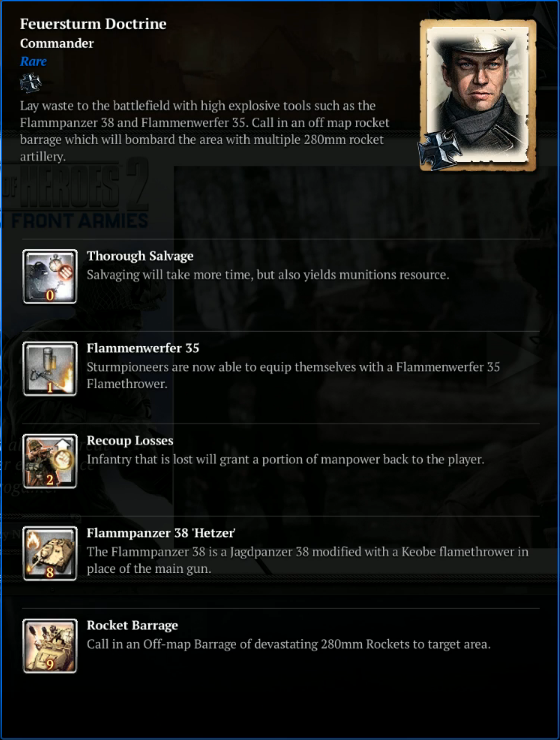 Flammerwerfer 35: Sturmpioneers are now able to equip themselves with a Flammerwerfer 25 Flamethrower. Recoup Losses: Infantry that is lost will grant a portion of manpower back to the player. Flammpanzer 38 'Hetzer': The Flammpanzer 28 is a Jagdpanzer 28 modified with a Keobe flamethrower in place of the main gun. Rocket Barrage: Call in an Off-map Barrage of devastating 280mm Rockets to a targeted area. Source: http://www.coh2.org/topic/43730/relic-stream--october-28Personally, I believe that the Heatzer should cost 30 less fuel, 40 less manpower, and come out at 7CP. Because it's rahter lacking durability wise (It died in 4 hits from Pershing, so its probs the same as a JP4) Its not a problem. But I dont think its worth getting this over a Panzer 4 J. The other abilities are decent in my opinion. Flamers, Popcap Free Walking Stuka Barrages, an actually useful Relief Infantry Ability. and the Uber Salvage to back all of this up. a Decent Urban Offensive Commander. I dont think you should base the usefulness of a Hetzer based off of its engagement with the brand new heavy tank for the USF..... If it has the durability of a JP4 that's really good. Those things are tough to crack. Flamers don't really matter anymore honestly, not for OKW considering Volks have an incredibly lethal flame grenade, maybe before that was added. Flamers on OKW Squads are nice, I wonder if they'll be able to swap between minesweeper and flamer or does it disable flamer like everyone else? The manpower regain seems useless, I don't know about anyone else here but I find OKW have boatloads of manpower at all stages of the game. If you could exchange loses for fuel or munitions that would of been a lot better. Seeing thorough salvage in another doctrine is great. Seeing a rocket barrage is also really good, you dont need to pickup the mechanized truck just for a Stuka anymore. I hope this gives OKW a bit of variety, but its definately not as good as some of the current doctrines just a refreshing change from the ordinary. AND MORE MANPOWER AND INFANTRY SPAM IS A GOOD F******NG IDEA??? Well, I don't mind that manpower blitz, sort to speak. You never know when it may happen you run out of the MP, even with OKW, and you can salvage a lot of munis with the first ability. But that Hetzer was just underwhelming. I was doing calculations how its going to be pwnd by TDs... But after this stream I realized not only zooks blobs can just stand in front of it and own it hard while bathing in its fire, but probably Cons throwing AT nades, lol. But God, its so hard to satisfy everyone and balance between useful and OP. You see folks crying "NOT BUYING THIS", but if its any useful it would be OP and P2W. But either way, I'm getting these doctrines because they still offer some interesting choices, I'm sure there will be some re-balancing in the future. And i'm not sure flamethrower will be good on Pios. Also, how useful is a dedicated AI tank @ 8cp? ( you've presumably already got the flame-pios by that stage ). I'd quite like to see the ability to switch guns actually; not an amazing AT gun, but enough to take on light-mediums. IMO a bit of a gimmick that late ( considering OKW's lack of AT ). ^^^ Yes WTF is wrong with people and is something being done about these online stream idiots who saturate us with their useless human garbage? Hetzer will cost 280/100, yes its confirmed. Company of flame wars continues. It's becoming over centralised in gameplay i feel. Then people whine about why Sturms has flamethrowers. You know, your riflemen can be upgraded with flamethrower package, just saying. Hard counters to core units shouldn't be doctrinal. Yes....but then again they have no flame nades.....or panzerschreks, or high accuracy vet. (volks vet is 20% at vet 2 + 40% at vet 4 while sturm pios have 30% at vet 4 and 5 while riflemen have vet 3 30% accuracy). Reason with all this vet accuracy is because they increased the flame thrower scatter if i am not wrong.